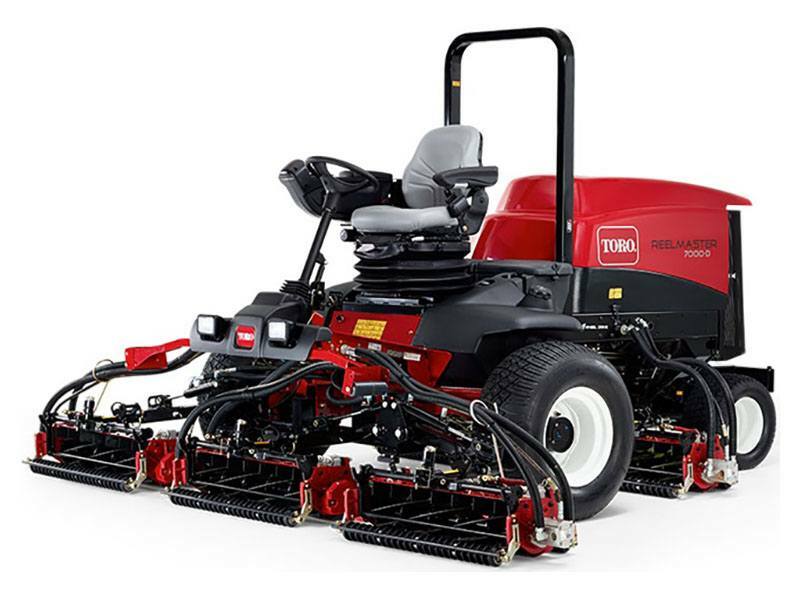 The Toro® Reelmaster® 7000-D is equipped with a powerful 55 hp (41kW) Yanmar® diesel engine and a SmartCool™ temperature-activated, auto-reversing fan that automatically blows debris off the air intake screen to keep the engine cool. High-torque reel motors allow the Reelmaster 7000-D to power through tough scalping and verticutting jobs, resulting in high productivity. This product also features Toro’s industry leading EdgeSeries™ dual precision adjustment (DPA) cutting units. Available in 27 inch or 32 inch width. Optional standard air-ride suspension and an ergonomic control arm keeps operators comfortable and productive. POWERFUL YANMAR® DIESEL ENGINE: The Reelmaster 7000-D is powered by a 55 hp (41kW) Yanmar® diesel engine that includes an exhaust after-treatment system that ensures machine emissions meet the EPA requirements and that your course can do its part for the environment. SMARTCOOL™ SYSTEM WITH AUTO-REVERSING COOLING FAN: Variable speed, temperature actuated reversing fan. Blows chaff off intake screen to help reduce overheating. Big time saver which reduces that amount of times an operator has to stop and exit the unit to clean the back hood. 4-WHEEL DRIVE: The Reelmaster 7000 features a unique, parallel hydraulic traction system that assures full-time, bi-directional 4-wheel drive. Parallel hydraulic flow between front and rear wheels means that you will have 4-wheel drive assistance in turns, enabling easier trimming around objects without tire scuffing and dependable traction on hills and wet terrain.